East Zorra Mennonite Church, Tavistock, Ontario. Source: Ontario's Places of Worship. Amish Mennonite families immigrated to Southern Ontario from Alsace and Lorraine from the late 1820's to the 1870's. As Wilmot Township filled up they moved westward into South Easthope and East Zorra Townships. By 1837 these settlers had organized into the South Easthope and East Zorra congregation. The first resident leader was Deacon Nicholas Roth. The following year Dr. Peter Zehr (a minister and medical doctor) arrived and the young congregation had a resident minister. Bishop oversight came from Wilmot congregation until 1853 when Joseph Ruby was ordained bishop. The bishop administered the rites of communion, baptisms and marriages. For 46 years the congregation continued as a house church. A meetinghouse was built in 1883 with the first service held on September 9. It was built on the 16th line of East Zorra beside the cemetery that had been established earlier. With additions front and rear this meetinghouse served until 1951 when the congregation constructed a new building. As the meetinghouse filled to overflowing the group founded daughter congregations at Cassel (1935), Tavistock (1942) and Hillcrest (New Hamburg, 1964). In 1966 some members of East Zorra began holding separate meetings because they wished to remain more conservative. In 1967 they bought the 17th line school house and established the Maple Grove Mennonite Church. East Zorra's Sunday School began in 1903 to teach the German language to the younger generation. Sunday services alternated between worship and Sunday School until 1930 when both were held every Sunday. The German-language Ausbund was used for singing first in the homes and in the meetinghouse until 1900. When four part harmony was accepted, the congregation secured the Leider und Melodien hymn book. When English preaching began to be accepted by the early 1930s, the younger people also desired English singing. The congregation then began to use the Church and Sunday School Hymnal. In 1969 they purchased the new Mennonite Hymnal, followed in 1992 by Hymnal - A Worship Book. In 2004 worship was a combination of traditional and contemporary styles. Services have been in English since 1932. Winter Bible School and Young People's Bible Meetings began at East Zorra in 1920 with minister Jacob R. Bender as the encouraging leader.and orgainzer. In April 1933 the Lend-a-Hand literary society was started. In 1966 MYF (Mennonite Youth Fellowship) replaced the multi-congregational literary society, with each congregation sponsoring its own youth group. Girls club and boys club also draw children from the community. The East Zorra women organized themselves about 1918. In 1924 they received money from the church and the Deacon's fund to provide food and clothing for the newly arrived immigrants from Russia. Today the women are still support the wider Mennonite Women of Canada organization and Mennonite Central Committee projects. Over the years East Zorra has supported many missionaries. In 1979 East Zorra started to sponsor refugee families from Southeast Asia. Refugees from other countries have also been sponsored. Laurence, Hugh and Lorraine Roth.Daniel S Iutzi and Jacob R Bender Servants of God and the Church. Waterloo, Ontario : Historical Committee of the Western Ontario Mennonite Conference, Waterloo, Ontario 1984. Lichti, Fred. A History of the East Zorra (Amish) Mennonite Church 1837-1977. Tavistock, Ont. : East Zorra Mennonite Church, 1977, 132 pp. Mennonite Reporter (12 October 1987): 16. Stock, Robert. "Social Change in the Mennonite Community, With Special Emphasis on Education and the East Zorra Amish Mennonite Congregation." 1967 Mennonite Archives of Ontario. Church archival records at Mennonite Archives of Ontario. Address: Box 997, R.R. 1, Tavistock, ON, N0B 2R0; located 5 km southeast of Tavistock on the 16th Line, East Zorra Township. Wagler, Shirley. 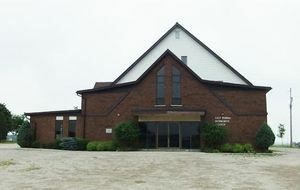 "East Zorra Mennonite Church (Tavistock, Ontario, Canada)." Global Anabaptist Mennonite Encyclopedia Online. January 2004. Web. 20 Apr 2019. http://gameo.org/index.php?title=East_Zorra_Mennonite_Church_(Tavistock,_Ontario,_Canada)&oldid=154211. Wagler, Shirley. (January 2004). East Zorra Mennonite Church (Tavistock, Ontario, Canada). Global Anabaptist Mennonite Encyclopedia Online. Retrieved 20 April 2019, from http://gameo.org/index.php?title=East_Zorra_Mennonite_Church_(Tavistock,_Ontario,_Canada)&oldid=154211. This page was last modified on 1 September 2017, at 13:08.